*3.6 Liter H6 Engine @ 325 HP*6-Speed Manual Transmission. *Sport Shifter. *19 Sport Design Wheels. *Wheel Caps w/ Colored Crest. 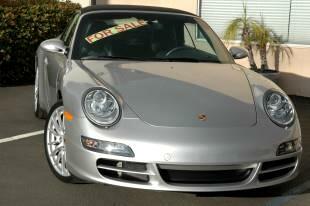 *(PSM) Porsche Stability Management*(ASR) Traction Control*(ABD) Active Brake Differential. *(POSIP) Protection System. *3-Spoke Steering Wheel w/ Leather. *Power Seat Package w/ Lumbar. *Heated Front Seats*Porsche Crest in Headrests. *Intermittent Wipers w/ Rain Sensors. *Power Heated Side Mirrors. *Automatic Climate Control. *Carbon Filtered Ventilation System. *Bose High End Sound System. *Remote CD Changer. *Bi-Xenon Headlamp Package. *Removable Center Windscreen. * MSRP $92,220.00---This 2005 Porsche 997 Carrera cabriolet is a one owner California car with only 4970 miles on the odometer. Incredibly the owner purchased the Carrera and never found the time to drive and enjoy it. It stayed in the garage except for the occasional weekend outing or for a scheduled oil service at the dealership.----When the Carrera came to us, we performed our pre-purchase inspection report and found that a few things were due for servicing because of time, obviously not because of mileage use. The tires were replaced as they were the original set when new and were in need of replacement due to age. We flushed the brake fluid and also performed a major service on the 997 which again was due because of time.----Pre-purchase inspection report by our Porsche Factory trained technicians available to review.----Clean Title and Carfax.